If you’re like most companies, you rely on multiple data sources, each with different reporting tools to manage company information and analysis processes, but you need to bring together all of that data for richer analytics. This article will discuss data warehouses as the solution. Almost all companies of any size are relying on multiple data sources for company information, such as an Enterprise Resource Planning (ERP), Customer Relationship Management (CRM), Payroll, and vertical industry systems, perhaps as well as data sitting in manual spreadsheets. 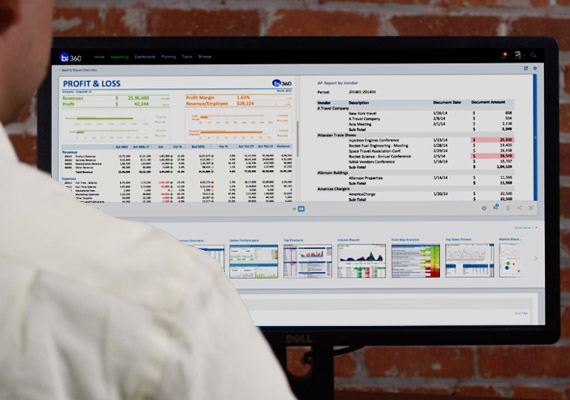 Even if you have a great accounting system report designer or pre-built online analytical processing (OLAP) cubes as one of your data sources, one of the biggest ways for management to make sound business decisions requires the ability to utilize financial reports and/or dashboards to look across all of your company information. Unfortunately, each of the data sources or systems typically have their own unique BI tools. And that’s where a data warehouse comes into the equation, likely solving this prevalent business problem. This article will discuss the benefits of a data warehouse (DW) as a solution to data management with a Microsoft SQL Server. Every once in a while, a company needs to answer a question that is outside the regular BI reporting done for performance management, and this is called ad hoc reporting. This article will discuss the benefits of this functionality and what to look for in a solution to best meet your company’s needs. Financial reporting is arguably the most utilized solution in the Business Intelligence (BI) world of analytics – and serves as a foundation for other functions, like data visualizations, budgeting and forecasting, and consolidations. Generally speaking, financial reporting is analysis done in a comprehensive, routine manner to make sense of company data for better decision-making. Ad hoc reporting and analysis zooms in for a more particular type of report. Ad hoc refers to something done for a specific reason, so ad hoc reporting refers to a report that professionals need for a particular query. Furthermore, ad hoc reports usually drill deeper or answer questions that the regular company-wide reports are not addressing. Ad hoc reporting enables business users to seek answers to their own questions regarding company data, without interrupting or changing the course of organizational reporting permanently. Because the data is coming from the same sources, the analysis is consistent and accurate, but much like project budgeting, questions and projects can arise outside of the standard, routine reporting that guides the overall course of the entire company – and different corporate cultures have different needs.